Hurricane Fran. Image made from GOES satellite data. 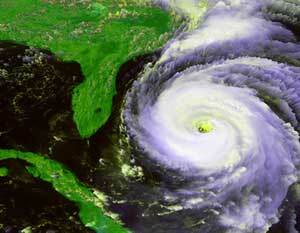 Hurricanes are the most violent storms on Earth. 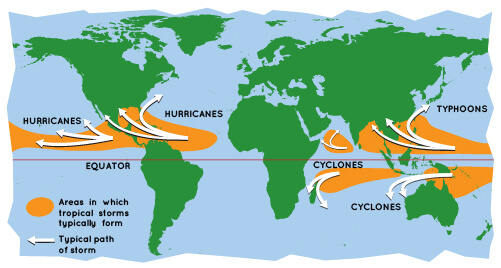 People call these storms by other names, such as typhoons or cyclones, depending on where they occur. The scientific term for all these storms is tropical cyclone. Only tropical cyclones that form over the Atlantic Ocean or eastern Pacific Ocean are called "hurricanes." Air from surrounding areas with higher air pressure pushes in to the low pressure area. Then that "new" air becomes warm and moist and rises, too. As the warm air continues to rise, the surrounding air swirls in to take its place. As the warmed, moist air rises and cools off, the water in the air forms clouds. 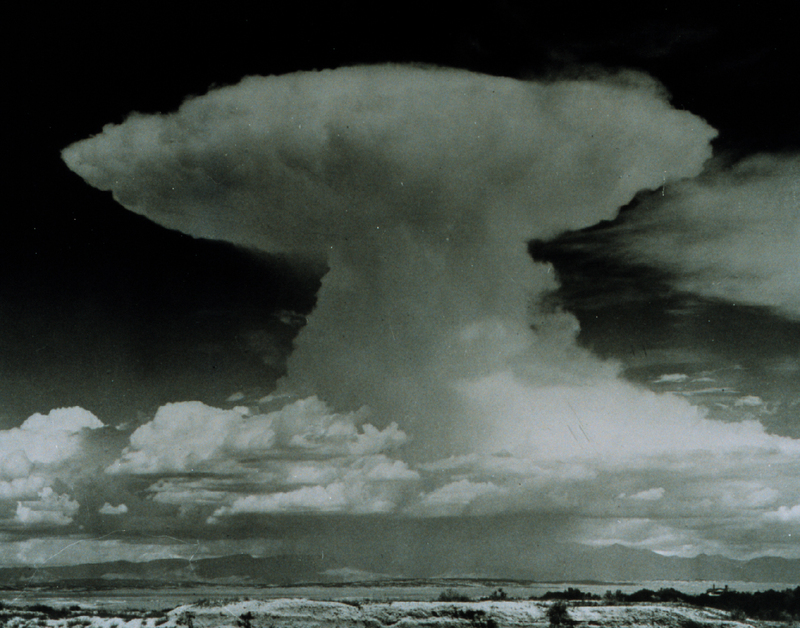 The whole system of clouds and wind spins and grows, fed by the ocean's heat and water evaporating from the surface. Storms that form north of the equator spin counterclockwise. Storms south of the equator spin clockwise. This difference is because of Earth's rotation on its axis. If you could slice into a tropical cyclone, it would look something like this. 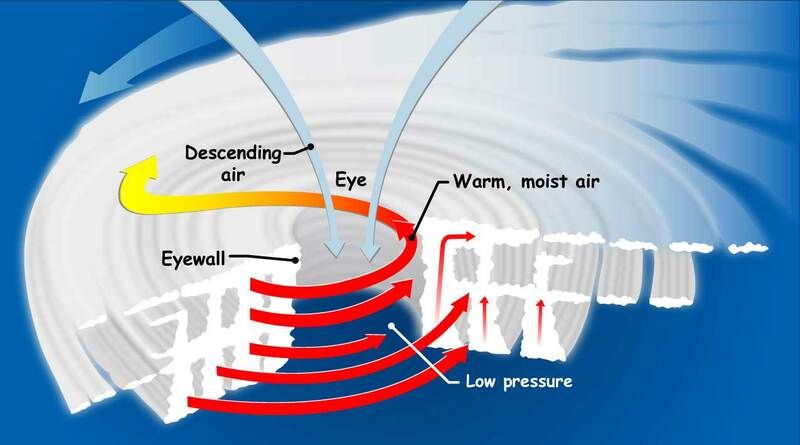 The small red arrows show warm, moist air rising from the ocean's surface, and forming clouds in bands around the eye. The blue arrows show how cool, dry air sinks in the eye and between the bands of clouds. The large red arrows show the rotation of the rising bands of clouds. When the winds in the rotating storm reach 39 mph, the storm is called a "tropical storm." And when the wind speeds reach 74 mph, the storm is officially a "tropical cyclone," or hurricane. 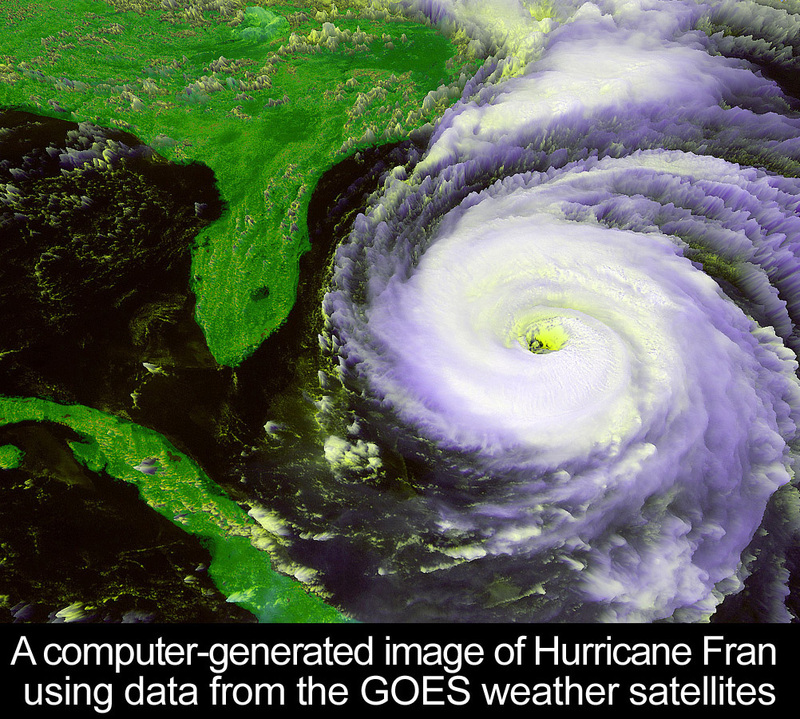 These satellites, built by NASA and operated by the National Oceanic and Atmospheric Administration (NOAA), save lives by helping weather forecasters predict and warn people where and when these severe storms will hit land. Here is a movie of Hurricane Katrina, which struck the coast of Louisiana, Alabama and Mississippi on August 29, 2005, as a Category 3. This movie was made from images taken by the GOES weather satellite. In the movie you can see the storm starting to form in the Atlantic on August 24 and becoming more and more organized as it moves over the warm waters of the Gulf of Mexico.